Did you know that many people are increasing their energy bills simply because they haven’t insulated their water heater? Your water heater keeps 20 to 60 gallons of water hot (depending on the make and model) — whether you are there to use it or not. Then, when you do use some of it up, it takes even more power to heat the cold water up to the proper temperature in order to replace the hot water that you used. One thing to keep in mind is that some water heaters say in their paperwork to not insulate them. So, don’t insulate yours until you check and make sure first. Many people have the temperature of their water heater much hotter than it actually needs to be. A tip for saving on your energy bill is to turn down the temperature on your water heater. To do this, drop the temperature down a little bit at a time until someone complains; that is when you’ll know the temperature you need to be at to be hot enough, while still keeping down your energy bill. 1. Clean your water heater, especially the top of it. Otherwise, the tape you are going to use won’t stick. Also move any items that are currently placed around your water heater. 2. If you haven’t already, purchase a special kit for insulating your water heater. Inside will be a blanket of fiberglass batting that is attached to a heavy plastic sheet. You will also find some heat-resistant tape. 3. Using a metal tape measure, measure your water heater. Add 3 inches to the width of your water heater. That way, you won’t have to compress the fiberglass blanket, and as a result, you will get the most out of it. Compressed fiberglass blankets don’t work as well to preserve energy. 4. Before you begin cutting into your insulation blanket, make sure you are wearing work gloves and a dust mask. Next, roll the insulation blanket out on a clean flat surface that you feel safe cutting on. Then, with a black magic marker, mark out the measurements you just took of your hot water heater. Go ahead and cut the insulation blanket to the proper size; you can use scissors or a utility knife. 5. Find one of the edges that will run from the top of the tank to the bottom of the tank, and then with your scissors or utility knife, cut one inch of the fiberglass batting away from the plastic cover. This will become the flap that you use to overlap the other side of the insulation blanket when you wrap it around your water heater. 6. 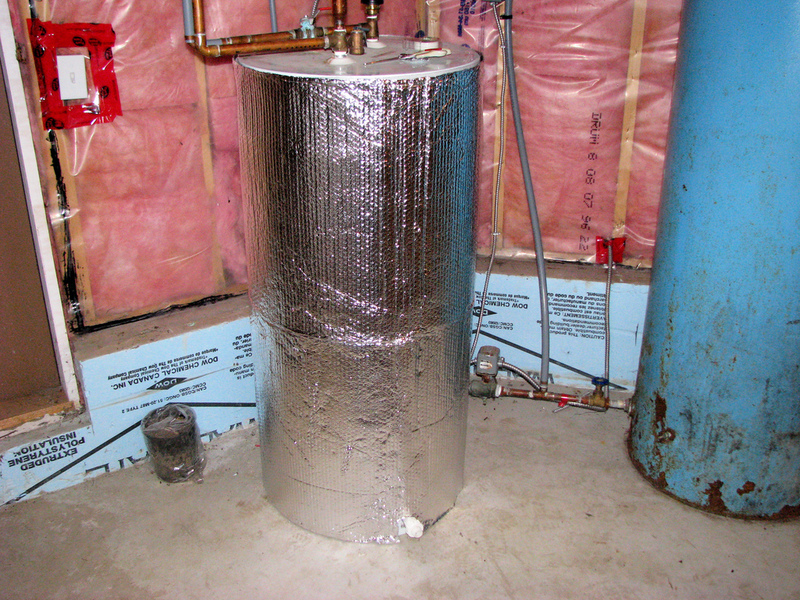 Next, wrap the insulation blanket around your water heater to test if it fits correctly. If it’s too big, then cut some of the excess from the side you didn’t cut the flap on. Then, wrap it again. Repeat as necessary. 7. Feel through the insulation blanket for the controls. Cut a flap over the controls — leaving the top attached so you can get to them when necessary. 8. Cut enough insulating blanket to cover the top of your water heater, and tape it on if a piece isn’t provided with your kit. Of course, cut any holes for pipes or whatever else is on top. 9. Insulate the hot water pipe leading out of your water heater. If the pipe is straight, there are pre-cut foam insulation tubes that you can buy. If they’re not straight, there is fiberglass or foam insulation tape you can buy that will work. You don’t want to cover the top of a gas water heater. Be sure not to cover any vents on your gas water heater. Don’t block the air flow to the burner in the bottom of your gas water heater, because then your pilot flame won’t get enough oxygen and will go out. Overall, insulating your hot water heater isn’t that hard, and it can save you 4% to 9% on your energy bill each year!